Image caption Twenty-six members of Tim Piazza's fraternity are facing charges after his February death. Three more students have died since. 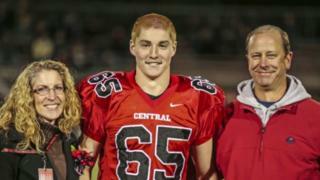 Penn State University student Tim Piazza was pronounced dead in the early hours of 4 February. Like 13 other pledges to the Beta Theta Pi fraternity, the 19-year-old had been taking part in a "run the gauntlet" event at the chapter's house, which involved drinking a mix of alcoholic drinks at a fast pace. Authorities announced on Monday that the FBI had recovered a surveillance video they believe was intentionally deleted. They say it showed that Tim was given at least 18 drinks in the 82 minutes before he fell 15ft (4.6m) down the steps of the fraternity house's basement. But it would take about 12 hours before any of his fraternity brothers called emergency services. Medical reports say he had a fractured skull and irreversible traumatic brain injuries. His spleen had ruptured in multiple places, causing extensive internal bleeding and haemorrhagic shock. Now 26 members of Beta Theta Pi are facing charges related to his death that range from hazing to involuntary manslaughter. While horrific, this incident is not isolated. Three other students at different US universities have died since Tim's death - two in the last couple of weeks. There have been 70 student deaths attributed to hazing since 2000. This does not include cases dismissed as accidents. "Universities tend not to be regulators until someone dies," said Bloomberg journalist John Hechinger, the author of True Gentleman: The Broken Pledge of America's Fraternities. He spent two years researching and writing the book, meeting students and reviewing disciplinary and court records while examining the role of fraternities. "They're in the height of their power at the very moment that concerns are deepening", he told the BBC. Today's fraternities and their like have origins in the 1820s. They have become a uniquely American tradition on campuses across the country. A loose confederacy of groups, sororities and fraternities may have dozens of chapters nationally at different institutions. They operate with a huge degree of autonomy and levels of supervision are varied. As their popularity and membership levels have risen, universities have been able to use them as a way to draw in prospective students. While they are largely independently funded through donations and student contributions, colleges sometimes offer subsidies and incentives like cheap leases on properties. Founded on conservative values of camaraderie and philanthropy, they enjoy a high representation in high-earning professions and in politics. Sororities and fraternities have about 400,000 undergraduate members nationally and own about $3bn (£2.2bn) of property. The outside view of US college culture and so-called "Greek life" is founded in its prevalence in popular film and television culture - something that focuses heavily on the partying aspect. "You have this 1978 movie Animal House. I'm not sure it was its intention but it satirised and glorified the drinking culture. It was deeply influential in what people thought a US college experience should look like," Hechinger said. Undergraduates in the United States can be as young as 18, but the national drinking age has been 21 since the 1980s. "When the drinking age went up, it became harder for students to find alcohol so fraternities became a sort of under-age bar. This heightened their overall power and made them a hot ticket. "In huge universities they control the flow of alcohol." The National Institute on Alcohol Abuse and Alcoholism contends that college students have higher incidence of binge-drinking than non-college peers. All four students who died this year were reported to be new members (or "pledges"). The selection process for "rushing" applicants can sometimes last months, and provisional members do not know if they will be made a full member. "This creates a power imbalance where the older members can tell them what to do," Hechinger explained. Hazing, defined as activities or situations that intentionally cause embarrassment, harassment or ridicule, or that risk harm, is widely banned as a practice but initiation ceremonies continue to be prevalent as part of fraternity "traditions". Not all of these are solely alcohol based. In April a student was charged with smearing peanut butter in the face of a student with a deadly allergy. Hechinger points out that one of the ways that universities and fraternities have tried to combat controversies is by banning or suspending the pledging process, or not allowing the newest students to apply. "That way they're not so desperate to join - they'll have an established group of friends already," he said. Sigma Alpha Epsilon, the fraternity Hechinger focused his research on, had 10 members die between 2008 and 2014. After the fraternity banned the initiation process, they have not had another death. Research showing alcohol and hazing related deaths are nothing new, but data shows fatalities appear to be on the increase. Hechinger said his extensive research suggested one of the reasons could possibly be because of increased consumption of stronger forms of alcohol. 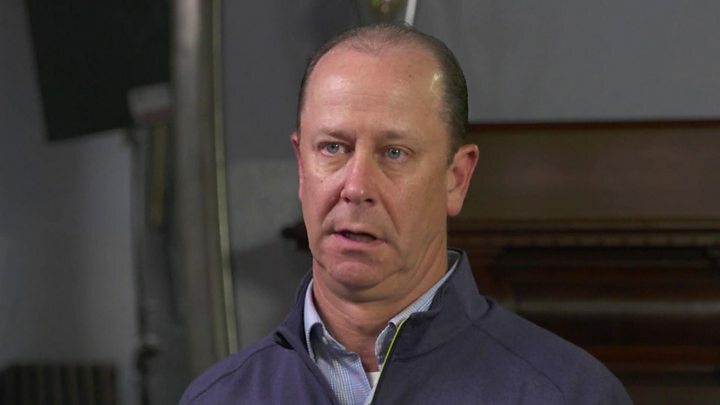 "Beer kegs are cheaper, but for under-age drinkers they are harder to hide," he said. "Scientifically it's very difficult to physically poison yourself with beer. With the shift to hard liquor you can literally drink yourself to death in an hour." Universities have reacted to deaths and reports of sexual assaults in fraternities with a range of measures. Hechinger said the "standard" response was a temporary suspension of Greek life in the aftermath, including alcohol bans and reform pledges by the groups involved. But there are cases where more radical action was taken. Some have banned Greek life altogether and developed their own models of internal colleges with housing, but those reform measures were done when the system was less popular. Sororities and fraternities are extremely influential organisations nationally and at university level. A total abolition of them could cause major infrastructural problems, including with student housing. Since the deaths of 20-year-olds Andrew Coffey and Matthew Ellis, Greek life has been suspended at their Florida and Texas State universities. In Florida, this comes in the form of an "indefinite ban" - their president is demanding a "new normal" before activities can return. Other allegations of hazing incidents have led to similar measures this year at the University of Michigan, Montana State University and Ohio State. At a state level, anti-hazing laws have been implemented, but questions around meaningful deterrence remain as controversies and deaths continue. Whether the spate of tragedies this year is enough to initiate lasting change remains to be seen; the stories from the last couple of months must be all too familiar for the parents of victims, including Tim Piazza. Speaking at Monday's press conference where new charges were announced, his father Jim said: "Tim was a happy and caring human being and a wonderful son who just wanted to join an organisation to find friendships and camaraderie. "Instead he was killed at the hands of those he was seeking friendship from. "It's time to man up, fellas, and be held accountable for your actions. "Hazing needs to stop. There is just no place for it. A statement needs to be made."